No matter what part of the country you come from, you'll love being an SDSU Aztec! Each fall and spring our counselors travel the country—check our schedule to see if we're coming to a city near you. Even better, come visit our campus. We'd love to meet you in person! San Diego State University (SDSU) is one of 23 universities in the California State University system. When you are applying for admission to SDSU through Cal State Apply, you are using the California State University common application. With 412,000 students and 43,000 faculty and staff, the CSU is the largest, most diverse, and one of the most affordable university systems in the country. 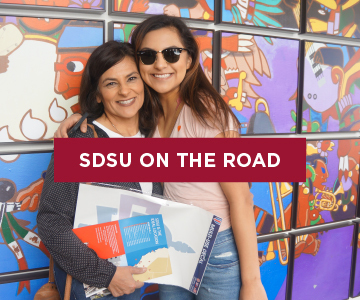 With an enrollment of more than 30,000 students, SDSU is the largest institution of higher education in the San Diego region and one of the largest in California. SDSU has become a top choice for undergraduates as evidenced by the record number of applications received each year. According to U.S. News & World Report, SDSU ranked ninth in the nation in freshman admission applications received in 2010. One of SDSU's freshman admission requirements is completion of a standard set of courses in high school. There are seven categories, labeled A through G. Read about the A–G courses. These terms refer to both courses and students. Lower-division courses are at the 100 or 200 level, and upper-division courses are at the 300, 400 or 500 level. Lower-division students (also known as underclassmen) have completed less than 60 semester units and are usually freshmen and sophomores. Upper-division students (also known as upperclassmen) have completed 60 units or more and are usually juniors and seniors. SDSU accepts transfer applications from upper-division students only. Under California law, most out-of-state students cannot establish residency to waive nonresident tuition at SDSU. You must prove that you have moved to California for reasons other than your education. Learn about California residency for tuition purposes.